Caenorhabditis elegans is a small worm (1-mm long) that can be isolated from rotting vegetable matter, feeding on the bacteria present on it. 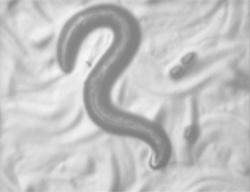 C. elegans is a powerful system for cell and developmental biology, neurobiology and genetics. Numerous resources have been developed for researchers working with this model system (wormbook, wormbase, wormatlas, wormweb).